Charles was born in Isleworth, London in 1981 and began his career with local non-league side Brook House (the present day AFC Hayes). In 1999 he signed for Crewe Alexandra but did not make a first team appearance during his two years with the club. Following a loan spell with Hyde United and his release by Crewe, he returned south and spent a season with Hayes before joining Aldershot Town, whom he helped win the Isthmian League Premier Division title, and promotion to the Conference, in 2002/03. 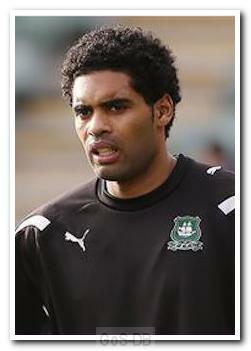 In September 2003 Charles had a brief loan spell with Lewes before moving to Farnborough Town the following month. He played 35 times for the club over the next 15 months, and won two England C caps, before a move to Barnet for a reported fee of £12,000. In his first season at Underhill he helped the club win the Conference and was a regular member of the team over the following 18 months, as they consolidated their position in the Football League. In February 2007 he returned to Aldershot Town on loan, a move made permanent in July of the same year after he was released by Barnet. The following year saw Charles secure another Conference winners medal, as the Shots won promotion to the Football League, and also the Conference League Cup, and he was named in the Conference National team of the year. The 2008/09 season saw him virtually ever-present at the centre of the Aldershot defence and he won the Supporters Club Player of the Season and Players' Player of the Year awards. In January 2010 he became team captain and was an integral part of the side which made it to the League Two play-offs. After more than 180 games in his second spell with the club, Charles left the Recreation Ground in 2011, having sustained a serious knee injury in the final game of the season, after which he was not offered a new contract. Having recovered from injury, he signed for Northampton Town in March 2012, initially on a short-term deal. However, he did enough to earn a 12-month contract at the end of the season. In January 2013 this contract was cancelled by mutual consent to allow him to move to Home Park on a deal until the end of the season. He appeared 11 times in the following three months, mainly as a centre-back, as Argyle scrambled to retain Football League status. In June 2013 Charles signed a one-year deal at Luton Town but made only a single start in the Hatters’ side that won promotion from the Conference Premier. On leaving Luton at the end of that season he spent a few weeks with nearby Dunstable Town before agreeing terms with Conference Premier Nuneaton Town in October 2014. Five months on he moved to Worcester City until the end of the season and then, at the age of 34, joined Halesowen Town for the 2015-16 campaign. However, in November 2015, Charles was again on the move, this time to Stratford Town, who were playing in the Southern League Premier Division. After a season at Stratford he signed for Walton & Hersham in the Combined Counties League Premier Division before swiftly moving on again in October 2016 to sign for Rugby Town in the Northern Premier League Division One South.